In 1971 a team of psychologists designed and executed an unusual experiment that was to be aborted before it had reached the half way stage. The Stanford Prison Experiment is now mandatory in the curriculum of first year students in a wide spread of disciplines. What was most notable about this experiment wasn’t just the abuse of power, nor that the head of the experiment lost his impartiality and objectivity, it was that despite approximately 50 outsiders encountering the ongoing experiment as it deteriorated, only one questioned its morality (this led to the early termination of the experiment). I studied these experiments and others in the first year of university. I also studied experiments that show the extent and manipulative power of peer pressure. As a whole, what we learn from them is that we exist within the rule of law for a reason. We receive our power through law, our laws are created through a democratic system and we balance these powers delicately through three bodies, a legislative an executive and a judiciary. Of all the people in the world who should be well aware what happens when power is created outside of this bubble, it is academics within universities. Social movements within any nation are restricted from within the confines of the law in which they operate, but what about international ones? Movements such as BDS (the Boycott, Divestment, Sanctions movement against Israel) that cross borders, that are fed through social media and exist almost exclusively in the nethersphere, what restricts the abuse of power of those movements? How can someone feed such an animal and not worry about what happens with the power that it creates? BDS does have specific aims. One of these is to force Israel to comply with a non-binding UN resolution (GA194). BDS defines it as an international law even though it is nothing of the sort. The demand to flood Israel (not the Palestinian state) with refugees that would bring about the de-facto end of the democratic State of Israel. 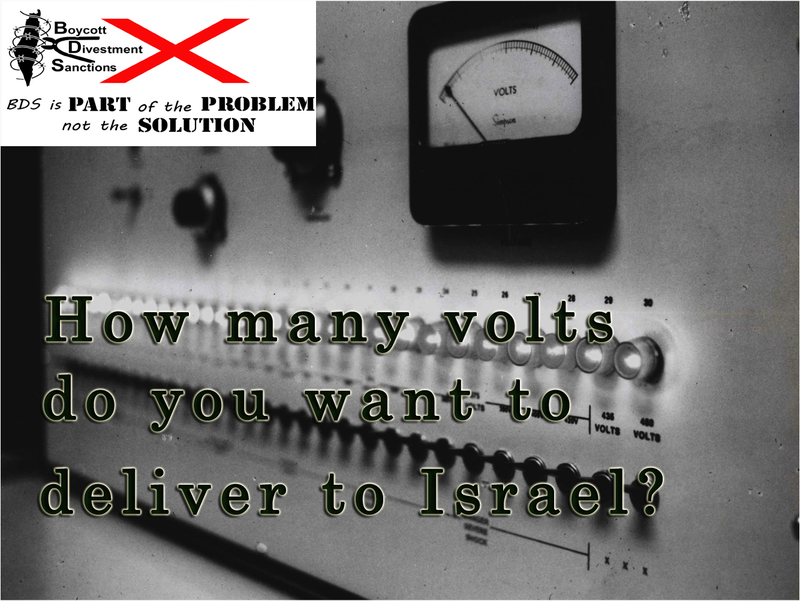 Those supporting BDS do not necessarily support this position, they see the boycott movement simply as pushing forward the peace process, or in the terms of the Milgram experiment, simply delivering a small electric shock. 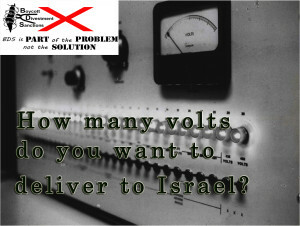 The leaders of BDS, such as Omar Barghouti, openly declares he is in favour of a Palestine with no Israel, or in the terms of the Milgram experiment, delivering enough electric current to kill the subject. When someone empowers Omar Barghouti by supplying his movement with ‘their vote’, they do not get to decide when the experiment ends. Understand this: Of the tens of thousands of social experiments that have taken place, there is not one, not a single example, that would suggest empowering the BDS movement is a good idea. It hides its goals, it bends its own rules, it has no executive, it has no legislative and it has no judiciary. It is a monster being fed by differing levels of hatred. The ones with the lesser hatred deliver the small electric shocks, leaving the true monsters to deliver the death blows. Even Islamic societies within the university campus are strengthened by every single vote BDS receives. Those empowering BDS carry on as if they bear no responsibility for the way others abuse the power that they have given it. BDS is a monster led by hard-core antisemites, those who are most vicious, those with the deepest hatred, those willing to deliver the harder blows, these are the people driving the movement by default. As the many academics who have been personally boycotted can testify to, the ‘institutional boycott’ idea is a fallacy to convince those only willing to deliver the small electric shock. Israeli academics are frequently shouted down, refused entry and openly boycotted. The blame for this too is placed at the door of anyone empowering any level of the BDS movement.When you vote BDS you empower those like Marsha Levine, you give strength to the bigots, the racists, the antisemites. You do not get to decide who does what. Other groups that empower BDS support boycotting cultural and artistic endeavours, as the recent Guardian advert explained. So when movements such as this empower screaming mobs to ban a US citizens artistic performace on the grounds of his personal ‘political views’, each and every one of the signatures of the advert bears responsibility for such disgraceful censorship. For some, there may be a different line in the sand, but within a movement that has no clear vision, no rules, no regulations and no ceiling, everything becomes allowable somewhere. A movement that is infested by open racists with deep rooted hatreds, will clearly exhibit racism and hatred. It also corrupts from within, and in Stanford, even the one conducting the experiment became lost as the situation deteriorated. Nobody is immune. We know how social experiments such as this end up, we have seen it all before. It isn’t about going after or punishing a single academic. It is about removing the very virus that is infecting academia. To identify it for what it is, then to extract it and eliminate it. Regardless of your political persuasion, BDS is a dangerous, insidious movement that will corrupt, and will continually bend to the most extreme vision. It doesn’t matter what you think, what you believe, or where your red line is, when you create a monster like BDS it will be the sadistic, the brutal, the ideologically extreme, that carry through their vision to the end. Academics are the very people who should know this better than most, yet they are the ones leading the charge. It seems some of them need to go back and study just what happens when power is assumed undemocratically and internally confined, what peer pressure brings to the equation and how human beings react to power in specific circumstances. BDS is facing legislative pressure in nations that have identified the undemocratic, racist, dangerous threat that BDS contains, France has already banned it, it is about time the UK did too. Keep up to date, subscribe to the blog by using the link on the page…follow the FB page for this blog: and follow me on Twitter. Please, if you can, also consider making a donation. Research is expensive and time consuming and whilst I do what I can, there are serious constraints that impact on what is possible. This brilliant article should be circulated to all Jewish media, as it is the definitive description and explanation of BDS. BDS has indeed much in common with the Hitler Youth and even the wave of Labour supporters who voted for Jeremy Corbyn. 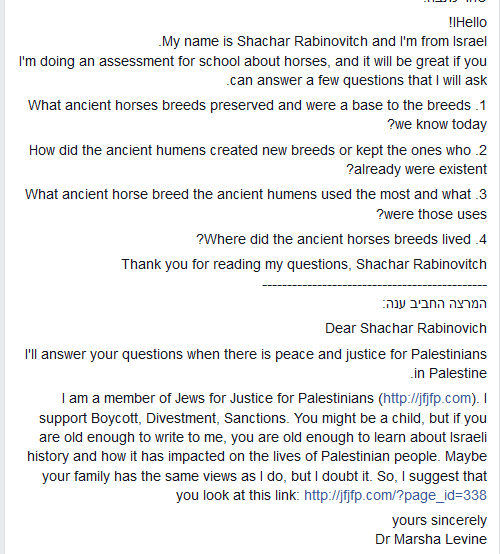 If you took a straw poll of BDS supporters, asking them 20 questions about the history of Israel and its present situation, you would get some pretty weird answers! Oh David there is so much wrong here it is hard to know where to start. Let’s start with ” BDS abused a 13 year old girl” . Assuming you have described the situation accurately, and I have no reason to think you haven’t, the girl was abused not by BDS, but by Marsha Levine. You may as well argue that Hannah Weisfeld has been abused by The Zionists., or even by ” The Jews”. BDS is not a social experiment, it is a catch all expression for numerous instincts to boycott Israel, divest from Israel or sanction Israel or any combination of these instincts. To suggest that anyone that adopts one or more of these instincts is responsible for the behaviour of everyone else that may have done so is ludicrous. Then talk of ” empowerment”, which I can only see as empty rhetoric. The notion that Marsha Levine’s behaviour is an outcome of an AAA resolution is well, I don’t know…. Power is often assumed and internally constrained. To say that power is only legitimate when ” democratically” bestowed is absurd. I don’t recall having a vote on whether you should have the power to write your articles. Such a creed would certainly exclude the power of Jewish self determination. The AAA resolution seems to suggest BDS type instincts but they are not responsible for what instincts others adopt or how they give expression to those instincts. I might argue that your writing your articles empowers the nut job ” Friends ” organisations and you are therefore responsible for their behaviour. Even if that were so I wouldn’t consider that a good reason why you should quit writing them. Oh dear I could go on but I won’t…..
Oh, Steven. How gratifying to learn that boycotting Israel, divesting from Israel or sanctioning Israel (or any combination of these) is an “instinctive behavior.” That explains why it is irrational, mendacious, counterfactual and ahistoric. Why it depends on emotional manipulation, cherry picked and decontxtualized factoids, ad hominem, straw man, non-sequitur, post hoc, ad ignorantum, ad nauseum (big lie) and bandwagon argument; delivered by (personal) agenda driven celebrities as “testimonials” (ipse dixit) and other forms of hearsay; in order for these “instincts” to persist; in the face of the atrocities and betrayals of Progressive principles routinely committed by the Arabs. Most puzzling in that, the immediate victims of these “instincts”, are these same Arabs, whose livelihoods evaporate as a consequence of your exercise of your “instincts”. It also helps explain why the pronouncements of Palestinianist pundits and apologists are a catalog of the denial mechanisms one sees in alcoholics, drug addict and their enabler/co-dependents. [http://www.peggyferguson.com/userfiles/10846/file/NewPDFSw_CartButtons/AddictionWorksheets/Defense%20Mechanism%20In%20Alcoholism.pdf] Projection, Rationalization, Denial, Avoidance, Deflection, Manipulation, Lying and Blaming; being the most prominent. When, Steven, when are you going to stop enabling this self-destructive Arab behavior? By denying them the respect and honor that those who own their own agency in the world posses; you are only prolonging their misery. You are not actually helping them at all. You’re merely gratifying yourself. Stephen, there does not seem to be any weight to your argument. Do you understand social experiements? They are set up and designed to investigate social behaviour. BDS is not a social experiment, but we have 10,000’s of social experiments to draw on in analysing whether a movement like BDS is a good idea. There is not one, not a single one, that suggests strengthening BDS would be a good idea. If you think there is, find it for me. Empowerment – not sure why you object to the use of the word, I think you should google it and check the definition. My use is highly accurate. Again, your objection to the power and constraint position doesn’t hold water. All my actions occur within a bubble where power is already constrained. Take the academics response as an example, had she sent it to a 13 year old from Clacton, opposing local policies set in place by UKIP, it would have been front page news. She wouldn’t do it of course, because she would be restrained by the laws and norms of the bubble in which we live. Her action occurs outside of that bubble and highlights precisely the danger of BDS. The academic reacted differently because she was not constrained (come on, it was a 13 year old girl). BDS depends on the individuals acting with restraint outside of a bubble and we have plenty of examples of research to show that is a nightmare waiting to happen. How did my instincts get into this ? inclination/ attitude/ propensity or choose your own and let the rest of my comment stand. You will understand that your comment is going to need quite a few re reads. But even on a first read it is clear that you are a highly accomplished poet. What a pity the Israel/Palestine thing can’t be settled on a poetry shoot out. It probably could Stephen, but the Palestinians would bring knives in case they lost.! And the Israelis would bring tanks, helicopter gun ships,, white phosphorous and all kinds of stuff. Bringing up the usual lies, I see: The white phosphorous accusations have been thoroughly debunked, many times. As for Israel having better armaments, that is the ONLY reason Israel still exists. If the Arabs had the better armaments, there would be another Holocaust. They have certainly tried, quite often, even with their inferior weapons. And if Israel were inclined to wipe out the “Palestinian” Arabs, it has had the means to do so for a long time. So the notion that Israel would choose to do so of its own volition is clearly nonsense. Israel uses the minimum amount of force it judges necessary to protect itself and its citizens, against unrelenting attacks, by barbarians set on its destruction. BDS is very much like the middle class burgers in German and Polish towns near concentration camps and death camps during the Shoah who claimed ‘we didn’t know, that wasn’t us’. Of course they knew. BDS wants other people to carry out their genocide. It’s just that simple. There you go David, your scribbling empowers and encourages comments like this. on that you can bet. A new Grinch had been found. a heinous crime would befit. ’tis what gave her rapture. an equine scholar of eminent stature. the tone, oh so callous. She was Israeli, to boot. inside that Judaic young filly. like a Zionist Trojan horse. of a young girl’s frolic? of Marsha and her BDS friends. “Peace and Justice,” they have yelled. Their true selves they cannot hide. would want such a melding. be turned into a gelding. Do not send her to the glue factory. Rein in this cantor’s canter.